While single-serve microwaveable bowls of macaroni and cheese are ready within minutes, these single-serve options don't work well for family dinners. 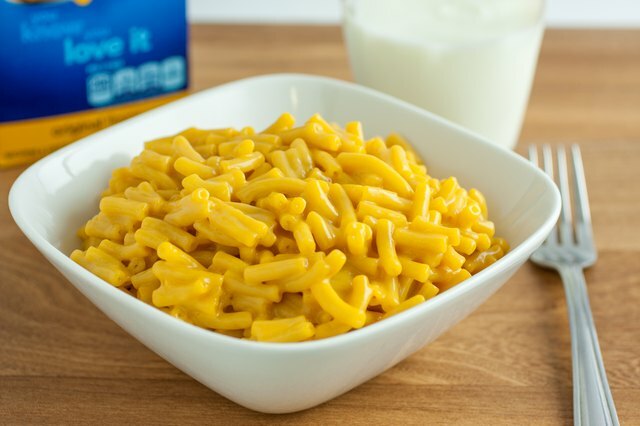 Products like boxed Kraft Macaroni & Cheese dinners, which include the pasta and packets of powdered or liquid cheese, can also be cooked in the microwave. 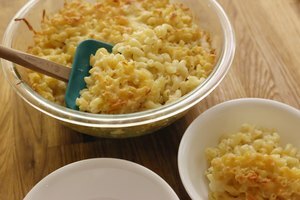 As with stovetop mac and cheese, the microwaved versions can be served traditionally, or with a bit of tweaking to make these meals your own. The pasta provided in Kraft Macaroni & Cheese packages cooks in about 12 minutes in the microwave on high, stirring every 5 minutes. Use a 2-quart bowl or casserole dish to hold the noodles and the water, and leave it uncovered while it cooks. To save the step of draining the noodles after they've cooked, the manufacturer suggests using 1 3/4 cups water for the standard-size package. 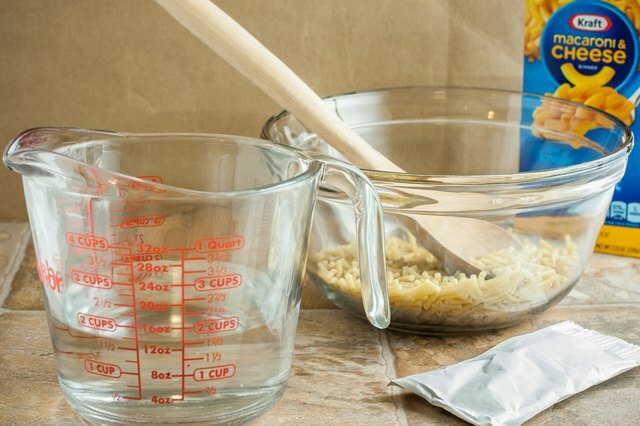 If you're using family style or another larger Kraft Macaroni & Cheese product, check package instructions so that you add just enough water to be absorbed by the macaroni. Once the pasta has cooked, remove the bowl from the microwave. At this point you can add the cheese packet, as well as a few generous spoonfuls of butter or margarine, and a roughly equal amount of milk. Stir these ingredients into the pasta , so that the ingredients are well combined. 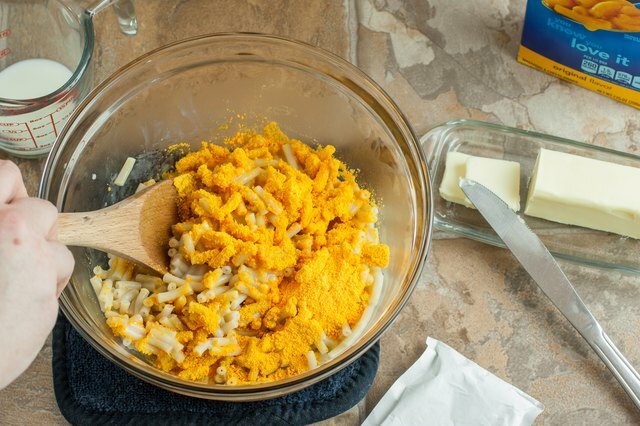 Adding additional ingredients to your macaroni and cheese can enhance the flavor profile of your meal. A spoonful of Dijon mustard undercuts the blandness some people dislike in a basic pasta cheese sauce. You can also replace the margarine with cream cheese, for extra creaminess, or olive oil, for a bit of sophistication. 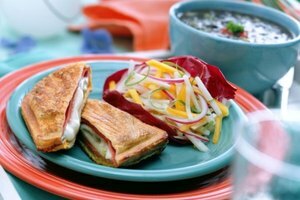 To amp up the cheesiness, supplement or replace the included Kraft cheese packet with other cheeses. Freshly grated Parmesan adds refinement, but you can introduce other flavor notes with feta, bleu or crumbled cheddar cheeses. Final touches include chopped fresh herbs, red pepper flakes or a pre-mixed blend of dried herbs. A few extra ingredients -- and time in the microwave -- allow you to use the prepared macaroni and cheese as a building block for fuller meals. Kraft recommends adding "pizza" ingredients like pepperoni, pizza sauce, chopped green peppers and shredded mozzarella. Or you might opt to cook up some frozen broccoli or peas in the microwave after the pasta is done, then combine these vegetables with canned tuna, a bit of sour cream and the prepared macaroni and cheese. 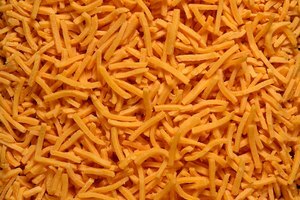 For a Mexican twist, toss canned beans, salsa and shredded pepper jack cheese into the prepared macaroni and cheese. 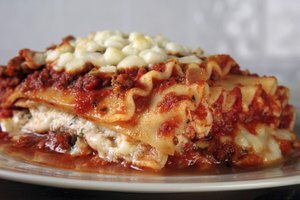 In general, it's best to give these meals an additional 3 minutes or so in the microwave.